Custom decals can heighten your business and product appearance to potential customers with news of promotions, sales, store hours, new inventory, or your company logo. Decals are a crucial driving force for attracting new customers in to retail or store front business. 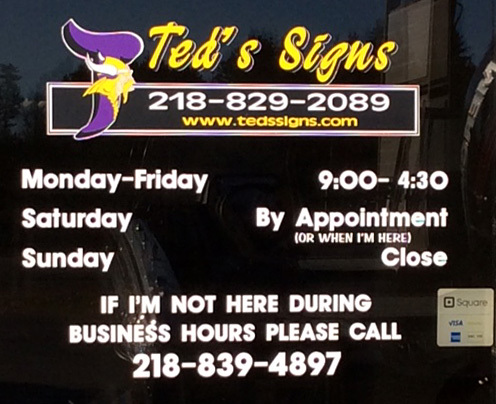 Transform your logo or store sign into attractive advertising that enhances your brand or product with Ted's Signs custom decals and graphics. Custom window decals can be applied to any glass surface. Graphic front with an adhesive back decals are easy on and off and perfect for special promos or store sales. Vibrant Colors with our state of the art printing technology, installs in minutes and looks great for years. Custom window decals are perfect for all industries including: Retail, Food and Beverage, Restaurant, Commercial, and Government.